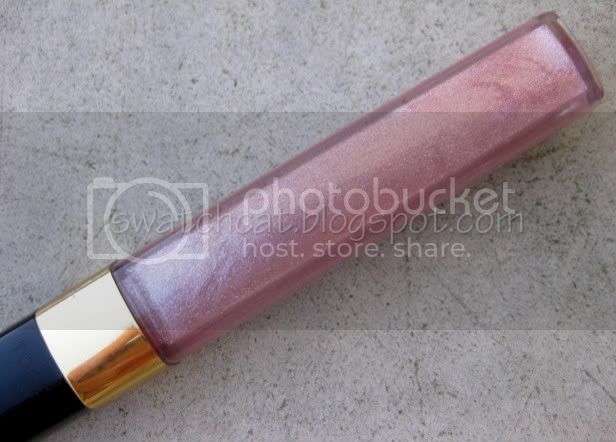 Here's another pretty from Chanel's Soho Collection, Star Glossimer. Star is a sheer pink loaded with silver microglitter. 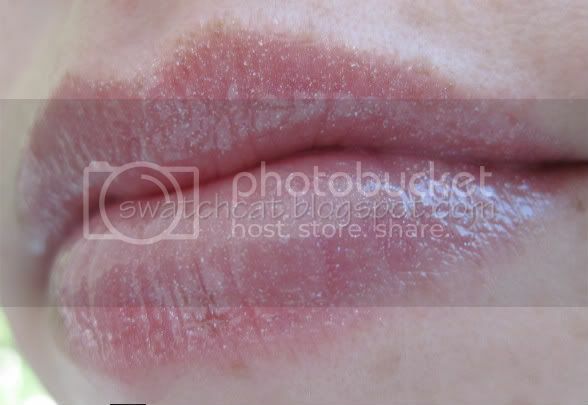 I know, I know...glitter doesn't exactly say, "Grown-up", but the glitter in this gloss is ultra-fine and really acts more as a shine enhancer. 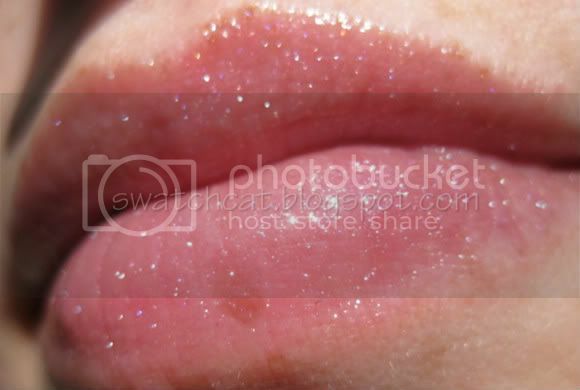 Unless someone is standing an inch from your lips, they're not going to notice the glitter. Given the sheerness of the color, it's great for those who just want to add shine to the lips, or for adding shine to any lipstick. 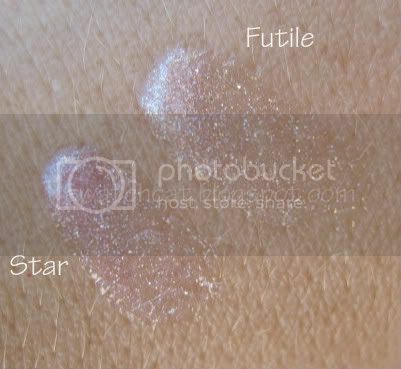 Once I got a good look at Star, it reminded me of Futile (from the Spring 2010 Collection), so I pulled it out for comparison. 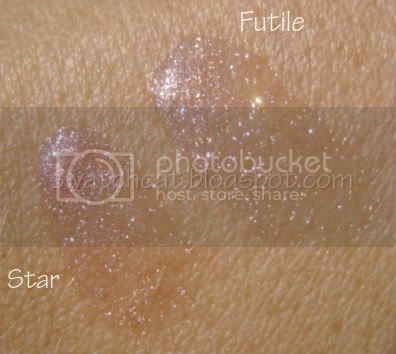 Turns out, Futile is more of a champagne pink with gold microglitter in much less quantities than in Star. However, given that both have that super sheer base, if you have Futile, you can easily skip Star, which is sold out in the U.S. online, anyway. Now, I'm not posting this to torture anyone who missed out on Futile, and therefore, might want Star. Soho was released in Canada and at selected locations around the world. Furthermore, there are rumors on various discussion boards that the Soho Collection will filter down to the luxury department stores (Saks, Neiman Marcus, Nordstrom, Bergdorf Goodman) in the October/November timeframe. 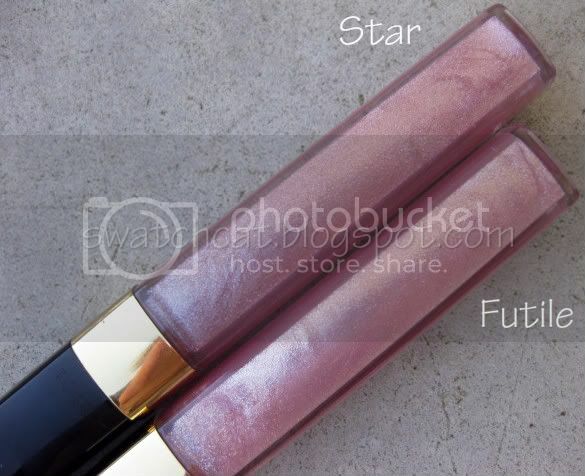 Fingers crossed, because there are a couple of items that, after seeing the swatches, I now want. OK, enough chit-chat, there are more pretty pictures after the jump! I know it's not much color, but it really is beautiful. The microglitter add tons of shine and a little sparkle. No glitter mess here! Thanks for this post. I loveee this colour on my lips (on my own and on top of lipstick). On its own it looks gorgeous with the SoHo Collection e/s 'Stupendous' and blush 'SoHo de Chanel' (or something like that). I want to get a backup since these are LE and am hoping that they're not sold out in Canada. Keeping my fingers crossed! Fingers crossed for you, too, Charisma! I am surprised how awesome the Soho collection is, because the promos weren't drawing me in.